Bitcoin and other cryptocurrencies are becoming an increasingly popular token for online gambling and betting, with many established online casinos now providing Bitcoin as an option. This review will cover everything there is to know about the long-running Golden Star Casino — including games, bonuses, security features and customer support. Golden Star Casino is a licensed online casino that has been operating since 2012. It is one of the larger casinos online that support bitcoin payments, and is also notable for offering a multitude of bonuses and promotions — including holidays and cash prizes. 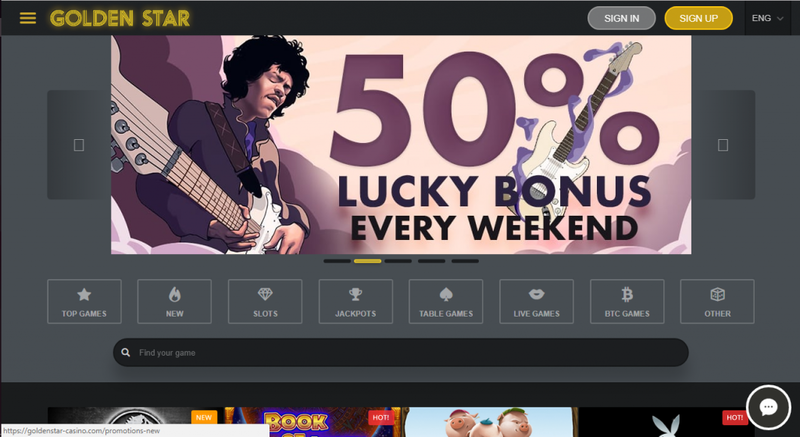 As all games are available to play for free, Golden Star Casino also counts as a free bitcoin casino. The library features a fun range of licensed slots from known providers such as Betsoft Gaming and Soft Swiss — many of which are ‘provably fair’. Additionally, there is a selection of live games, such as roulette, keno and blackjack, as well as Bingo, soccer and dice games. Golden Star Casino is mobile friendly, with no downloads required. The site auto-adjusts adjusts for optimal viewing across multiple devices. Players can begin gambling for free immediately, but must provide some identification if they wish to begin playing with money, as Golden Star Casino is not anonymous. Although its offering may not be as varied as some others, Golden Star Casino does boast top-notch functionality, varied promotions and ‘provably fair’ high quality titles. It’s licensing and positive user feedback also indicate an excellent security track record, which can be hard to come by in the ever-growing Bitcoin casino space. Golden Star Casino boast a range of slots featuring known brands such as Game of Thrones and Jurassic World, as well as unique Bitcoin slot offerings. There are also a range of table games such as roulette, blackjack, Baccarat and Pontoon amongst others. 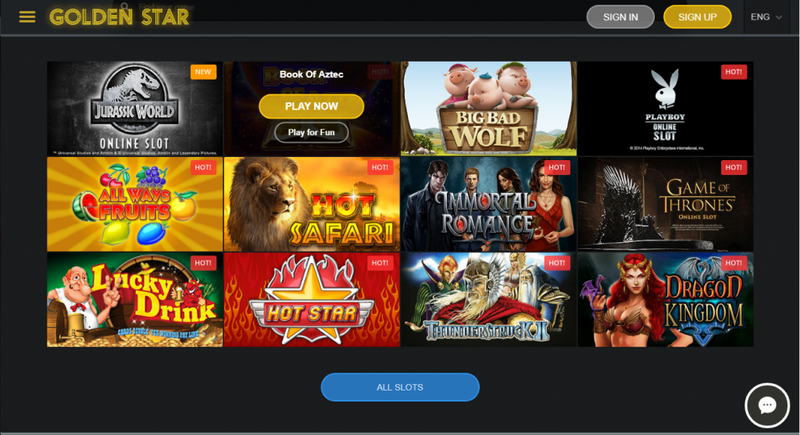 Using content offerings from known developers such as Betsoft Gaming and Soft Swiss, Golden Star Casino features popular international titles such as Slotfather II. There are also soccer, Bingo and scratch dice games available. All games feature Play For Fun versions, which means no currency is required to try out the titles.Players are instead supplied with the site’s FUN currency. Any titles provided by SoftSwiss are provably fair, with full transparency. Users can check the fairness of the results. Use of encryption does not allow the casino or the gambler to know the result of the game before it starts. In addition, each result can be checked by the player. The site also lists an in-depth breakdown of how titles are proved fair, right down to the maths involved. Golden Star Casino has a handful of offers you can claim. Its evergreen offers include first, second and third deposit bonuses. There is also a range of slot tournaments that happen weekly, as well weekend offers and bonuses. Whenever you play slots at Golden Star Casino you’ll receive complimentary points, which you can exchange for cash back. The more points you earn, the better your exchange rate. There are different tiers, ranging from New Star to Silver, with exchange rates increasing as the player moves up. One minor caveat here is that the tiers only apply to slot titles, so cannot be accrued on table games and video games such as live poker. Golden Star casino is unfortunately not available for UK users, but is available for the US, Canada and many European countries. The site is also available in multiple languages, including Finnish and Russian. When it comes to anonymity, Golden Star Casino has a policy of asking players for identification documents anytime, such as during critical actions like withdrawals — meaning players may not be able to conceal their identity. Golden Star Casino is not an anonymous bitcoin casino. In terms of security, It uses SSL encryption to protect players’ sensitive data. The casino games on the site have also been thoroughly audited by iTechLabs. Questions and complaints can be logged over at the Support page, where a contact form is used to send an email to Golden Star Casino’s admin team. The site also boasts Zendesk support facility, as well as open emails regarding support and affiliate opportunities. There is also a thorough FAQ section that covers common issues. Golden Star Casino is operated by Jubise International N.V, a company created and registered under the laws of the Government of Curaçao, and as such is regulated and has a registered address. Although the title offering is less varied than others, the games are consistently of high quality, and run smoothly across all devices and platforms. The range of slots in particular is excellent, featuring some top end titles. That many of its games are also ‘provably fair’ is a bonus. Moreover, the weekly bonus offerings and lively community give Golden Star Casino an up-to-date and modern feel. For Bitcoin and traditional currency players alike, fast banking is a major focus, adding to the intuitive feel of the site. Golden Star Casino also boasts a license and is under regulation, which while it removes the possibilities of entirely anonymous gambling for now, also adds an extra layer of security for players who are just beginning to explore the Bitcoin casino space.